Here is another student project in my March Book Madness feature, which has been running all month to celebrate the reading we do in my sixth grade classroom. Here, my student reviews a book in the Septimus Heap series, called Siren, by Angie Sage. I know very little about this series, other than they have pretty cool covers. This student is an advanced reader and his glog about Siren shows good thought and reflection. Last year, at our school, we had the wonderful illustrator and writer Mordicai Gerstein come in and work with kids around creating picture books. While he was here, he donated a few books for the library, and then the librarian in turn passed one of them along to me. It is called I Am Arachne, and Gerstein is the illustrator (and the writer is Elizabeth Spires). As part of my March Book Madness, I thought I would share some impressions of this collection of short stories inspired by Greek and Roman myths. Told entirely in first person narrative, the stories here are a retelling of very famous myths and some not-so-famous myths. I did like that Spires began with the story of Arachne and Athena, and then used her very poetic touches to have Arachne begin to spin the stories for us. Spires must have some background as a poet because there are lovely sentences and passages here that really capture the characters in these tales. Long after you read the stories, you might still hear the voices of the narrators. The 15 stories are short, but move along at a brisk pace, and this book would be a nice companion for a unit around Greek or Roman mythology (which is why the librarian passed it along to me.). Gerstein’s sketch illustrations are a nice complement to the stories, too. They are by nature, whimsical, and capture the mood of the stories. 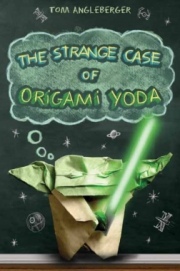 This is part of my March Book Madness series, and although I usually feature student projects, today I am sharing out my own review of a book that a lot of my kids have read: The Strange Case of Origami Yoda by Tom Angleberger. And it won a Cybil Award this year, too. The story centers on sixth graders, and one boy who declares that his origami version of Yoda gives advice independent of him. A kid asks, and the Yoda replies. The book is told from the viewpoint of one main character, but he has “assembled” it as a case book — with smaller stories from various characters — to determine if Yoda is real, or just a fake. The story moves towards the main character getting up enough nerve to ask a girl to dance. What I liked here was the “voice” of the writing. It felt as if Angleberger really captured the voice of sixth graders, with all of their quirks and social awkwardness, and also, their ability to still believe in something that is clearly at odds with reality (a finger-sized Yoda who gives advice.) The plot weaves its way towards a nice ending that nicely ties things up. The illustrations along the margins of pages was a hoot, and the use of things like text messages, notes from the principal, and more, added to the playful feel of the story. I wasn’t sure of what to make of the character of Dwight, whose Yoda is at the heart of the story. He is socially out of touch, great at math but little else, and often the brunt of cruel jokes and comments by others. Aspergers? The Strange Case of Origami Yoda is strange, but entertaining. PS — Here, the author explains how YOU can make an origami Yoda. Give it a try. The other day, I shared out a project about The Lightning Thief as part of my March Book Madness feature. Today, I am sharing out a Glogster project about one of the sequels in The Olympians series by Rick Riordan — The Sea of Monsters. Here is another in my March Book Madness feature, in which I am sharing out book projects and reviews from my students and myself. This one is about The Clockwork Three by Matthew Kirby. This student and I were actually reading the book at the same time, and having interesting discussions about how Kirby was slowly bringing the three main characters together. This glogster report about The Clockwork Three is actually in addition to a paper project he did on the book. Thank God for Mike Lupica. I’ve seen more of my boys reading his books over the years, due to the sports theme, than others when it comes time for choosing independent books. 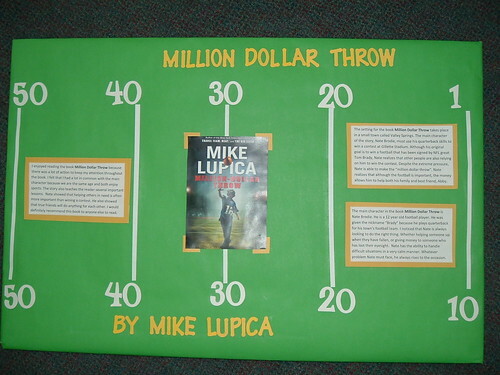 Million Dollar Throw is one that appeals to the football players and fans in my classes. I think they are intrigued by the million dollar reference, too. This student decided to do an offline poster, which is fine, and showed good insight into the characters of the book. His journal was full of questions and predictions. This is part of my daily March Book Madness feature this month. I am not all that familiar with horse-inspired books, but the girls in my class are. Here, one of my students reviewed No Small Thing by Natalie Ghent. Not long after this glogster project was made, I saw this book being passed around a small group of girls, no doubt dreaming of riding in pastures. This is another in my series of March Book Madness posts. For the past two years, I have taught The Lightning Thief by Rick Riordan as a class novel, with great success. This year, however, too many kids have already read it perhaps inspired by last year’s movie), so I am shelving it for the year. That saddens me, but I do see many other kids still enjoying it. This Glogster project is just one of a couple that were done on the series by my students. It continues my March Book Madness feature.